Make America bait again! 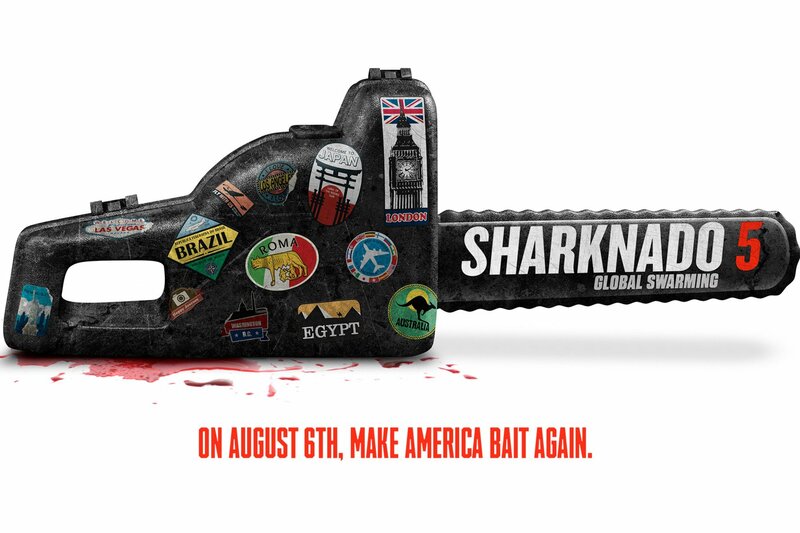 That’s the tongue-in-cheek tagline attached to the official art for Sharknado 5: Global Swarming, the latest entry in Syfy’s shark-ridden series that will now make land on August 6th. And though its tagline may be rooted in U.S. politics, Global Swarming looks set to steer the horror-comedy franchise into international waters, with the story – and we use that term rather loosely in this instance – once again centering on Fin Shepard (Ian Ziering) and his bionic wife, April (Tara Reid). For chapter 5, their young son has been swept up by a traveling ‘nado, jump-starting an international quest that takes the two series stalwarts everywhere from London to Rio to the winding canals of Amsterdam. Indeed, now that an official premiere date is locked in – coupled with a piece of art that cuts through subtlety like, well, a chainsaw tearing open a great white shark – it shouldn’t be too long now before we catch our first peek at Sharknado 5: Global Swarming in motion. And what’s a Sharknado film without a collection of cameos, each more ridiculous than the last? The official list includes Fabio (as the Pope), Tony Hawk (as a masterful weapons operative strategist), Clay Aiken (as a cutting edge technology genius), Margaret Cho (as a fussy bride whose honeymoon is interrupted by sharks) and Charo (as the Queen of England). Syfy’s cult franchise goes global when Sharknado 5: Global Swarming makes its debut on August 6th.